Porsche Cayenne revamped | What Car? 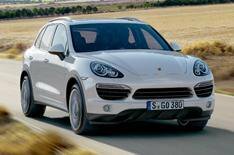 This is Porsche's next-generation Cayenne, which combines more power with improved efficiency. The Cayenne is Porsche's luxury, and lucrative, 4x4 it accounts for 50% of the company's profits which is now lighter, more powerful, but also a good deal more efficient, too. It goes on sale on May 29, and the range will include a hybrid with a V6 petrol engine for the first time. Much of the car's improved efficiency is thanks to a revised transmission system, which uses a new Tiptronic S eight-speed automatic gearbox with a wider spread of gear ratios. There's also an engine stop-start system to help boost economy and cut emissions. Efficiency and handling is also enhanced by the 180kg that Porsche engineers have shaved off the car's overall weight. The entry-level model known simply as Cayenne gets a 296bhp 3.6-litre engine with a claimed average economy of 28.5mpg up from 21.0mpg on the previous version. There's also a 240bhp 3.0-litre diesel, which averages 38.2mpg up from 30.4mpg. The new Porsche Hybrid is where the most impressive gains in efficiency can be found, however. Its 328bhp 3.0-litre supercharged petrol engine is combined with an electric motor that's housed between the engine and gearbox which together produce a maximum output of 375bhp. The hybrid set-up stretches the Cayenne's average fuel consumption to an impressive 34.4mpg and cuts its CO2 emissions to 193g/km. The hybrid version also has a feature called 'sailing-mode', which allows the car to cruise at speeds of up to 97mph with the engine off and disconnected from the transmission. Both of these versions use a 4.8-litre engine, with 395bhp for the S and 493bhp in the Turbo. Average fuel consumption is 26.9mpg for the S an improvement of 23% over the previous version and 27.6mpg for the Turbo also an improvement of 23%.